Ignite is software that coordinates and facilitates innovative and exciting speed networking events. It handles the planning, registration, processing, and reporting for an event. What is speed networking (or group speed networking)? Basic speed networking is a process where networkers meet one-on-one with other networkers in a fast-paced, structured setting. Usually an individual will have the chance to meet 5-15 other people. Ignite speed networking combines the excitement of basic speed networking with the more effective and comfortable environment of networking in small groups rather than one-on-one. At an Ignite speed networking event, participants meet at tables of 4-10 for comfortable networking sessions that last 5-12 minutes each. When time is up, everyone moves on to the next, pre-assigned table to meet with a brand new group of people. New opportunities to ignite a business spark are found at each table – duplicates are all but eliminated throughout the process. At the conclusion of an Ignite speed networking event, participants will have met with 20-50 contacts (maybe more), usually 40-50% of the attendees at the event. Why should I use Ignite software? The quick answer is that without the software, you won't be able to run this type of event at all. The software makes it possible to assign a dynamic number of participants to tables for multiple rounds of small-group based networking so that they are not seeing duplicates. Attempting that without the software might be theoretically possible, but it will take (literally) days or weeks to get the duplicates down to something bearable and it still won't come close to the results you'll have with the Ignite software. Have easy tools for planning, facilitating, and reporting an Ignite speed networking event. Enhance your networking program with an innovative and fun networking program. Have flexibility in your event with any number of tables, rounds, seats per table, and time at each table round. Be able to provide post-event follow-up assistance to the participants through reports showing attendees at each table during each round. Have an expandable platform that allows for other activities other than networking such as corporate brainstorming, industry discussion forums, etc. Draw more participation from a membership base that is searching for effective networking. Have a unique event available only through Ignite. What are the advantages to participants? Be able to effectively network in a comfortable and less intimidating environment. Don't underestimate this point - the vast majority of people who are participating in networking events are not comfortable in networking events. We have found this point to be, far and away, the most important reason why members love Ignite Speed Networking! Network with more individuals than through typical networking events. Participate in an innovative and fun event that will pale in comparison to run of the mill “cocktail reception” activities. Excel in a more comfortable and fun networking environment. Be networked with new people at every round of networking (during later rounds, some duplications may occur but will be minimized). 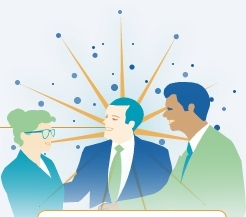 Learn effective networking techniques through energized networking conversations and repetition. Have the opportunity to practice proper networking, elevators speeches, etc. The key to the Ignite software is assigning the seating charts so that participants are networking with new people at every round as much as possible. If you were to try to create a seating chart for 100 people at 13 tables for 6 rounds, it would be near impossible to compute by hand and would probably take several days until you gave up.